Live-action segment "All Steamed Up"
"Butch Mario & the Luigi Kid" is the third episode of The Super Mario Bros. Super Show!. Its corresponding live-action segment is "All Steamed Up". 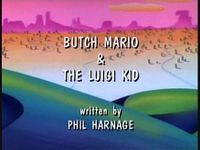 The title "Butch Mario & the Luigi Kid" is a wordplay on two real-life references: two Wild West Outlaws Butch Cassidy and the Sundance Kid, and a 1969 film about them, Butch Cassidy and the Sundance Kid. 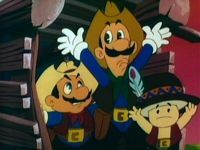 In the Wild West, Mario, Luigi, and Toad begin to search for Princess Toadstool, who has been kidnapped by Kid Koopa and taken into the Wild West. While traveling through the desert, Mario and Luigi notice a wanted poster on a nearby cactus with a hat on it. Looking at the wanted poster, Toad notices that it has Mario and Luigi displayed on it and the reward for their capture is 10,000 gold pieces. Hearing about the reward money, the cactus the poster is attached to suddenly springs too life, revealing itself to be a Pokey. The Pokey, desiring the reward, begins to attack Mario and Luigi, only to be stopped when it has a plunger thrown at and affixed to its face. In an abandoned mine shaft, Kid Koopa begins to taunt the captured Princess Toadstool, who is sealed in a cage. Koopa proceeds to give the Princess her food, three beans, and then leaves her, planning to starve her. While trekking up a hill of sand, Mario, Luigi, and Toad are suddenly confronted by Kid Koopa's second-in-command, Sheriff Mouser, and his brigade of Snifits and Ostros. After hearing Mouser's plan to capture them, Mario, Luigi, and Toad begin to run for it, with Mouser and the Snifits and Ostros chasing them. Running from Mouser and his minions, Mario, Luigi, and Toad come to a dead end: a flowing river. With Mouser approaching quickly, Mario decides to use several logs flowing down the river as stepping-stones to cross it. After Mario crosses the river, Toad does the same, as does Luigi, who narrowly makes it. Seeing Mario, Luigi, and Toad cross the river, Sheriff Mouser orders his Snifit minions to do the same. Unfortunately, the Snifits fail to make it across and fall yelling over a waterfall, leaving Mouser to, surprisingly, cry over and mourn their fate. Later, at a small town, Kid Koopa is in the process of reprimanding Mouser for his failure in capturing Mario, Luigi, and Toad. After having several threats thrown at him, Mouser begins trying to calm down Koopa, saying he will hire every available bounty hunter to track down Mario's group. 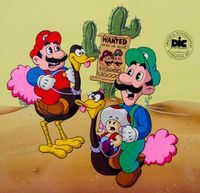 In the desert, Mario, Luigi, and Toad (now wearing cowboy outfits), having somehow gotten several Ostros to be their steeds, come across another wanted poster, this one saying Mario and Luigi are wanted for 30,000 gold pieces. As Mario and Luigi talk about their unfortunate fate, a nearby Tweeter, seeing the wanted poster, snickers to itself and flies away. As the Tweeter flies away, Mario and Luigi notice a nearby smoke signal spelling "HELP! ME!" followed by a crude image of Princess Toadstool when Luigi wonders "who's me?". Realizing the messages must be from Princess Toadstool, Mario, Luigi, and Toad begin to travel to where the smoke signals are originating. Reaching the mine shaft where the Princess is being held, Mario, Luigi, and Toad begin to enter the mine, only to be surrounded by Sheriff Mouser and his minions. Wielding a Cobrat, Mouser suddenly gets in an argument with the Tweeter from before, who wants its reward money for telling Mouser of Mario, Luigi, and Toad's location. With Mouser distracted, Mario, Luigi, and Toad, after knocking aside several Snifits, steal their Ostros, and run. Mouser, after lighting the fuse of a Bob-Omb, throws it at a nearby boulder, releasing it and causing to roll down at Mario's group. Running from the boulder, Mario's group find themselves in the town, with an army of Cobrat-armed Pokeys in front of them. Seeing a nearby building advertising free Italian food, Mario, Luigi, and Toad manage to run inside it, dodging the boulder, which bowls over the Pokey army. Inside the building, Mario, Luigi, and Toad are horrified to find Kid Koopa in it. A taunting Koopa proceeds to force them into a nearby prison cell and crushes the cell key in his hand. Coming up with a plan, Mario yells that he is dying of thirst. Mario's cries eventually attract an annoyed Sheriff Mouser, who proceeds to drink a glass of water in front of the brothers, trying to be cruel. As Mouser finishes his drink, he notices the Mario Brothers playing a game of Patty Cake. Wanting to know what the brothers are doing, Mouser is shoved by the two and has his hat knocked off, which Toad quickly hides himself under. Claiming to be delusional of thirst, the brothers are let off with a warning by Mouser, who leaves the building and enters a nearby, Koopa Troopa-filled bar. Mouser, after setting his hat and Toad down on a table, goes to get a drink. With Mouser gone, Toad sees a bag of Bob-Ombs, which he grabs, then quickly leaves the bar. Outside, Toad lights the fuse of a Bob-Omb and sends it into the bar, where it blows up. Toad runs to the prison that the Mario Brothers are held in and blasts the wall down, freeing, as well as dazing them. Seeing that the brothers are free, Sheriff Mouser sends a brigade of Koopa Troopas out to capture them. Mario, Luigi, and Toad manage to evade the Koopa Troopas and, taking some nearby Ostros, travel to the mine that Princess Toadstool is being held in. Traveling into the mine, Mario, Luigi, and Toad bump into a wall; using a Bomb Plant plucked from the ground, Toad blows up the wall, with Luigi caught in the blast. Mario, after happily seeing that Luigi survived the blast, rushes him outside for some fresh air, Luigi having inhaled a large amount of dust. Outside, Mario, Luigi, and Toad find themselves surrounded by Kid Koopa and his Koopa Troopas. Koopa suddenly challenges Mario to a duel, with a nearby Birdo's cheeps acting as the countdown. Suddenly, Koopa pulls out a small Piranha Plant before the countdown is done and has it shoot a fireball at Mario's group. Dodging the fireball, Mario pulls out a Cobrat and begins firing a barrage of projectiles. With Kid Koopa and his minions distracted, Mario, Luigi, and Toad run into the mine and accidentally run into the pit that Princess Toadstool is being held in. With Mario, Luigi, Toad, and Princess Toadstool effectively trapped, Koopa begins to taunt them. As Koopa prepares to throw Bob-Ombs into the pit, the Mario Brothers, having reworked the piping system in the pit, send a blast of water upward, raising themselves, Toad, and Princess Toadstool to the surface, as well as washing Kid Koopa and his Koopa Troopas away. Having been freed, Princess Toadstool asks how she can thank Mario. Mario says there are seven ways she can and begins to name various foods he wants, much to Princess Toadstool's delight. "Sheriff Mouser to you, you despicable felons!" When Toad blows up the wall of the Mario Bros.' jail cell, the unbroken wall is still in the shot immediately following the explosion. When Mario, Luigi, and Toad try to escape on Ostros, and Mouser throws the Bob-Omb, Mario, Luigi, and Toad can briefly still be seen standing on the mountain. The number of Snifits that follow Sheriff Mouser during the pursuit are reduced in one scene from four to two. In one part, the bomb plant that Luigi's holding has eyes. When Sheriff Mouser first sees Mario, Luigi, and Toad, his entire face is gray. When Mouser's hat comes off, the top of his head is skin color, and when he puts his hat back on, the top of his head is gray. 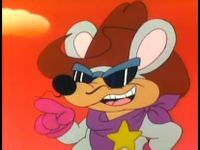 Also, when Mouser enters the bar and takes off his hat, the top of his head is back to skin color, and finally, when Mouser exclaims "Stop them! Stop those horse thieves," the top of his head is gray again. When Mouser enters the tavern, the Koopa Troopa bartender behind the counter has a strangely all yellow head, which reverts to the original coloring in the next shot. When Mario intently knocks off Mouser's hat in the jail cell, his (Mario's) usually tan hat becomes a rusty red/brown when Mouser questions why he knocked his hat off, but then switches back to tan. The Birdo that emerges from the cactus during the gunfight is sometimes seen peeking out and still hiding inside the cactus. When the giant boulder is chasing Mario, Luigi, and Toad as they flee on Ostros, the Ostro's heads are the same color as their beaks, which later go back to the normal color scheme. While Toad wears his pilgrim hat, his color scheme changes from him having a red hat with white spots and a white vest with red pants to the opposite coloration in this episode and remains this way for the rest of The Super Mario Bros. Super Show! When Sheriff Mouser says, "Stop them! Stop those horse thieves! ", when the Koopa Troopas slow down to stop, the red bands on their hats change to the colors of the hats themselves. This is the only episode on the first Shout! Factory DVD box set without a "The Worlds of Super Mario Bros. Super Show! Concept Art Gallery" part. It goes from "The Bird, The Bird" to "King Mario of Cramalot". Mario, Luigi, and Toad trying to escape from the prison cell and Sheriff Mouser is a reference to Bill and Ted trying to escape the saloon with Billy the Kid from the 1989 film, Bill & Ted's Excellent Adventure. This page was last edited on March 20, 2019, at 19:12.